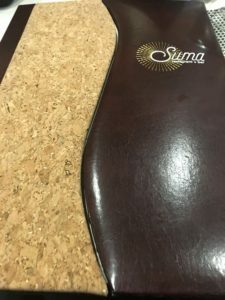 My first visit to Suma in Bethesda is underwhelming. The restaurant has taken over the spot previously occupied by Nest on Bethesda Avenue, offering seasonal new American cuisine. The patio is a perfect spot for enjoying a refreshing cocktail. But its late spring and the dishes are too heavy for the season, and entrees like pork spareribs and challah fried chicken are lackluster. Since I don’t write about restaurants when my experience isn’t primarily positive, I decide against a blog post. I visit Suma again in autumn, after several friends tell me they find it to be a worthwhile neighborhood restaurant. There’s a chill in the air, which rules out perching on the patio, but the interior has an inviting golden glow. The server presents a stunning cork and leather menu, with the restaurant’s name embossed in gold. 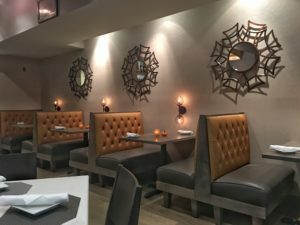 Something has changed since the June 2016 First Taste column in Bethesda Magazine, when chef/partner Gene Sohn tells writer Laura Hayes: “I don’t use tweezers to plate, we’re not shooting for fine dining.” Suma has stepped it up since its opening. 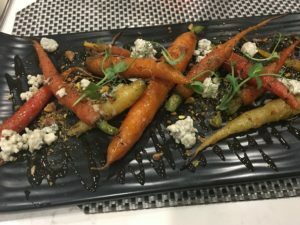 I think tweezers are involved in the composition of a gorgeous plate of braised carrots dotted with blue cheese, pistachio pieces, and drizzles of honey. This isn’t a bad thing- it’s beautiful and tastes as good as the raved-about vegetable dishes coming out of DC’s hottest restaurants. 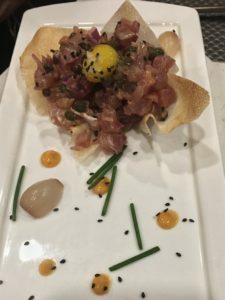 Tuna tartare also takes its turn as a delectable work of art, wrapped in a delicate phyllo packet and topped with a quail egg. More artsy touches come in the form of dabs of sesame yuzu and pickled onions. 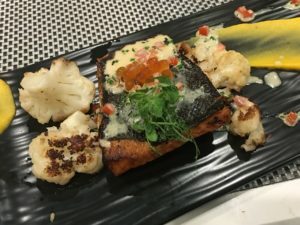 Wild sockeye salmon fillet is pan-seared and served with a painted smear of butternut squash puree, grilled cauliflower, and tomato dill cream. The salmon is well-prepared, but would be better with bolder spices. Further evidence that Suma has taken a turn towards fine dining is a dish like roast duck breast with smoked blueberries, confit spring roll and rosemary pan jus. I’m tempted but a $34 entrée isn’t what I have in mind. Now that I have more confidence in the kitchen, I’ll consider it for a follow up visit. It is possible to keep it casual at Suma. The menu includes a selection of creative pizzas. A friend raves about pizza topped with duck confit sausage, smoked gruyere, caramelized onion, scallions, and hoisin. 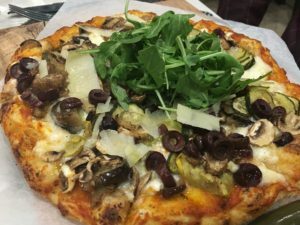 Roast veggie pizza topped with eggplant, squash, mushrooms, black olives, goat cheese, and arugula is quite good. Fall means a pumpkin dessert must be on the menu, and at Suma pumpkin crème brûlée fits the bill nicely. I’m always in search of Bethesda restaurants to recommend, and I’m now pleased to add Suma to the list. Lesson learned: first impressions are important, but second chances can yield surprisingly good results.